These last few weeks here in LA have been some of the most sweltering so far this summer. It’s hot, dry, and everything that’s supposed to be green is dried to a crisp. Everything’s thirsty. We haven’t had rain, REAL rain in a long time. I don’t remember the last time we had a good downpour to wash away the dirt and dust that coats everything both indoors and out. Sinuses and lungs feel parched and I’ve noticed that a lot of people have dry coughs right now. My skin feels dry and itchy. You can really feel the drought to your very core. Needless to say it hasn’t been pleasant, but there has been some reprieve for those that know where to find it. In case you didn’t know, herbs have special affinities for all sorts of ailments, but did you know that they are also energetic? No, not the sort of energetic where they’re bouncing off the walls like a sugared up child (though I’m sure there are herbs out there that can induce such glee), but the type of energetic that describes an herb’s action on the body. Herbs can be hot, warm, neutral, cool, and cold. They can also be drying, moistening, aromatic, astringent, sweet, bitter, pungent… etc. Some herbs can be a blend of several at once, take yarrow for example. If you have a bad sunburn, which energetic property sounds best to you? An herb that is warming and dry, or an herb that is cooling and moistening? Cooling and moistening right? Every herb has energetic properties, but today I want to focus on a few that are specific for cooling the body and removing stagnancy. Some of the herbs I discuss below can be found locally by most people which makes this a fun foraging project. When one thinks of peaches, most often the fruit itself comes to mind. And why not? They’re juicy, sweet, and delicious! You can probably agree with me that when you take a bite of a nice ripe peach you experience moistness, coolness, and and overall refreshing sensation when you eat them during the summer. While peaches themselves are cooling and hydrating in nature, it’s really the leaves, flowers, and twigs that offer the most amazing cooling benefits. 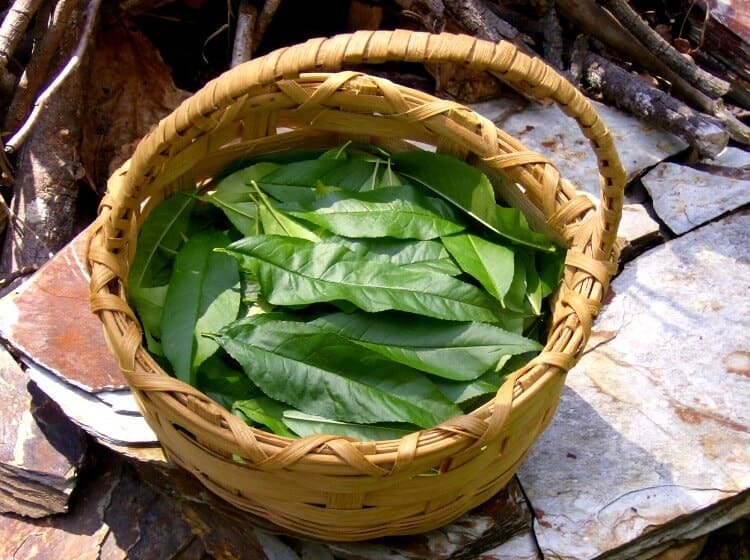 Peach leaves have been used as natural cooling aides all around the world. In traditional herbalism, almost the entire peach tree can be used as an herbal preparation in way or another. Peach is a traditional Appalachian and Southwestern remedy that has been gaining well-deserved attention from the herbal community in the last several years. This aromatic herb is both tasty and effective, and its calming and cooling properties give it a wide range of applicability. It has the ability to calm anxiety, heal wounds, soothe nausea and even moderate histamine reactions. The leaves, bark, flowers and even the fruit pits of this well known tree provide us an with an amazing array of healing actions that culminate in Peach being one of North America’s most important plant medicines. My absolute favorite way to use peach during the hot days of summer is as an elixir. Sounds fancy right? Don’t worry! This type of remedy is quick and easy to make. • Harvest enough fresh peach leaves and twigs to fill a mason jar (not too heavily packed). I like to chop up the leaves and twigs for better maceration. • Next, pour brandy over the top until completely covered. You may need to top it off every day for a few days until everything is fully submerged. • Let it sit in a cool dark place for 6 weeks. • Strain well (I use a nut milk bag ). • Pour the strained tincture into a nice clean jar or glass bowl and add 1 cup of raw local honey. • Bottle and label . • Enjoy on hot summer days! I love using this elixir when cooling off is hard to do without running the air. This remedy also works wonders for heat induced nausea, low appetite, intestinal dysfunctions, and as a digestive aid. Use it during times of heat/sun stroke for quick relief. • Add 1 dropper to water or juice 3 times a day. 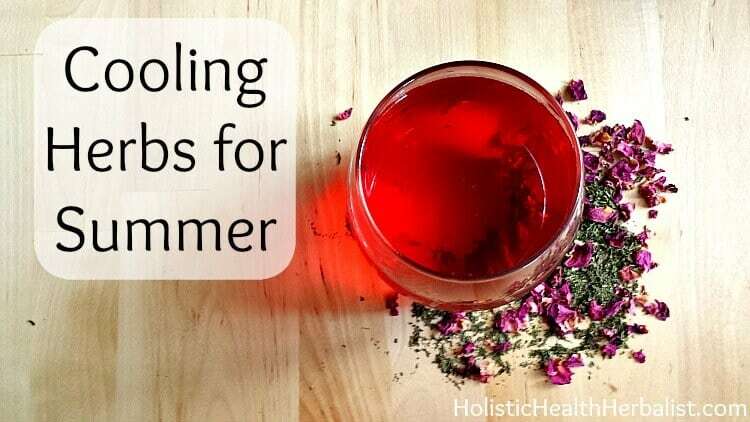 Hands down one of my favorite cooling herbs, rose lends a number of amazing benefits. Not only does it disperse heat, it is also calming and cooling emotionally. This is such a nice combination! I don’t know about you, but when I’m overheated I also tend to get those overheated emotions like irritability, anger, and just the overall grumpiness that comes with being too hot. Rose is one of those herbs that I have on hand at all times. Whether it’s a vinegar, salve, tincture, elixir, or just plain dried, I have rose nearby at the ready. My relationship with this briar beauty deepens every time I use it. I’m constantly amazed by her ability to treat wounds and infections, stave off emotional disturbances, and to of course bring down the heat! One of my favorite summer must haves is a rose infused vinegar. • Enough fresh rose petals to fill the jar (make sure the petals are fragrant!. You can also use dried petals , just fill the jar lightly to the top with petals and then pour the vinegar over them. Dilute the vinegar by adding 1 cup rose infused vinegar to about 7-10 cups of water. Soak a soft cloth in the mixture and apply it to sunburns to effectively pull out the heat. You will notice that the cloth quickly becomes hot after applying it to the skin. When this happens, remove the cloth, dip it in the rose vinegar mixture, gently wring it out, and then reapply the cloth to the sunburn. You may need to do this 10 or more times the first session. Repeat application every 1-2 hours for severe burns and more often for light to moderate burns. Once the skin is cool and stays that way, you can apply fresh aloe. This vinegar will also ease pain, lessen sun poisoning, and greatly reduce the redness of sunburns if caught in the first 24hrs. This cooling herbal remedy is amazing when used in conjunction with the peach leaf elixir. Heck, you can even add rose petal to the peach leaf elixir for a special treat. Of course we couldn’t leave out peppermint! Not only is this herb probably the easiest for most everyone to get their hands on (I mean who DOESN’T have peppermint tea in their pantry? ), it’s also effective for treating a number of summer heat ailments. Peppermint is such an easy remedy to use. Unfortunately, I think a lot of people forget about peppermint because it’s in just about everything from breath mints to cough syrups. So even though a lot of us may be desensitized to peppermint, it’s a must have when it’s hot and dry. There are two ways I love to enjoy peppermint during the summer and the first is as a peppermint hydrosol. Hydrosols are essentially herbal waters that come from steam distillation. It’s really easy to make them yourself at home and of course a lot cheaper than buying them at the store. I love to use a peppermint hydrosol as a facial mist when I feel the need for a refresher. Not only does the hydrosol smell great, it also pulls heat from the surface of the skin making it indispensable during hot, dry, or even muggy days. You can learn how to make a peppermint hydrosol HERE, or just buy it HERE and HERE. The second way I enjoy peppermint it as a cold herbal tea. It sounds simple, but when peppermint is paired with hibiscus , rose, and a few cubes of ice, magic happens! I like to make it in a big batch to keep in the fridge on hot days. It’s not often one thinks of sage as a cooling herb but let me assure you that it is (it’s actually a member of the mint family)! In fact, sage is one of the best herbs for people who sweat more than everyone else and is even more indicated for those dealing with hot flashes. Sage has the affinity for balancing the fluids in the body whether they are excessive are not enough and really lends itself well to those who get these issues during hot weather. A strong infusion of sage can help relieve stagnant digestion (the kind where you feel like food sits like a rock in your stomach) and is also beneficial for summer colds and flus where fevers can be especially uncomfortable. One of my favorite way to use sage is simply as a cold tea that can be sipped during particularly hot days. To make it, simply steep 1 tsp of dried garden sage in a mug of hot water. Make sure it steeps covered to preserve the volatile oils. Let the tea cool and then pour it over ice with a wedge of lemon. Drink up to 3 times daily. I have had horrible night sweats for several months now. I am 34 female, and have had extensive blood work done. Nothing shows up. What herbs can help with night sweats? Can you tell me a bit more about your general health and lifestyle? Have you also had your hormones tested?